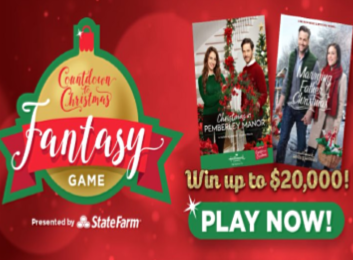 Hallmark Channel® Countdown to Christmas Fantasy Game – Win $20,000! ENTRY LIMIT – Limit: One (1) Weekly Entry per person for each Weekly Entry Period. ELIGIBILITY – The Promotion is open to legal residents of the 50 United States, the District of Columbia, and Puerto Rico (EXCLUDING, WITHOUT LIMITATION, SUCH RESIDENTS OF ALL OTHER U.S. TERRITORIES AND FOREIGN TERRITORIES), who are 18 years of age or older as of the date of entry. 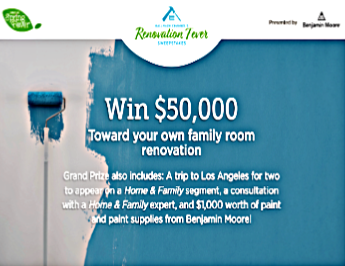 SWEEPSTAKES ENTRY PERIOD – The Promotion begins on Monday, October 15, 2018 at 9:00 AM Pacific Time (“PT”) and ends on Friday, January 4, 2019 at 5:00 PM PT. PRIZES – Grand Prize: One (1) Grand Prize Winner will receive $20,000 cash awarded in the form of a check payable to the Grand Prize Winner. The ARV of the Grand Prize is: $20,000. First Prize: One (1) First Prize Winner will receive $5,000 cash awarded in the form of a check payable to the First Prize Winner. The ARV of the First Prize is: $5,000. Second Prize: One (1) Second Prize Winner will receive $1,000 cash awarded in the form of a check payable to the Second Prize Winner. The ARV of the Second Prize is: $1,000. Weekly Prizes: There are a total of ten (10) Weekly Prize Winners. Each Weekly Prize Winner will receive $500 awarded in the form of a pre-paid gift card. The ARV of the Weekly Prize is: $500 each. WINNER’S LIST – For a list of winners, mail a self-addressed stamped envelope to the address below. Such requests must be received by 02/14/19. 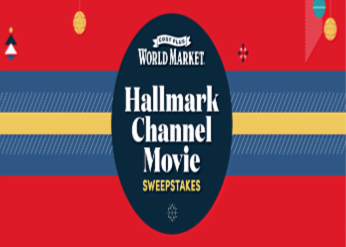 Cost Plus World Market’s Hallmark Channel Movie Sweepstakes – Win a walk on role in a Hallmark movie & more! Win a trip for 2 to Canada, a walk-on role in a Hallmark movie & more! ELIGIBILITY – The Cost Plus World Market’s Hallmark Channel Movie Sweepstakes is open to legal residents of the fifty (50) United States and District of Columbia who are 21 years of age or older at the time of entry (excluding residents of Puerto Rico, and all other U.S. territories and possessions). SWEEPSTAKES ENTRY PERIOD – The Promotion begins at 12:01 a.m. Eastern Time (“ET”) on 10/15/18 and ends at 11:59 p.m. ET on 11/16/18. PRIZES – GRAND PRIZE (1): A trip for winner and one (1) guest to Canada. Trip consists of round-trip coach class air transportation from a major U.S. international airport near winner’s residence to Canada, four (4) days and three (3) nights hotel accommodations (one (1) room, double occupancy), ground transportation to/from airport and hotel, ground transportation to/from hotel and filming location of a Hallmark Channel Christmas movie, the movie in which the winner will have an opportunity to have a non-speaking walk-on role, and a $2,000 World Market Gift Card for winner only. Approximate Retail Value (“ARV”) of Grand Prize package: $6,000.00. 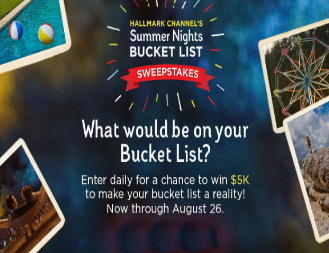 Hallmark Movies & Mysteries Summer of Mystery Sweepstakes – Win a trip to San Francisco! Win a trip to San Francisco & more! ENTER SWEEPSTAKES HERE – Hallmark Movies and Mysteries Sweepstakes page. ENTRY LIMIT – Entrants may enter in this manner once per day throughout the promotion period, regardless if the entrant has more than one email address. 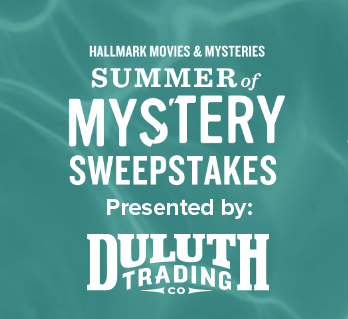 SWEEPSTAKES ENTRY PERIOD – The Hallmark Movies & Mysteries Summer of Mystery Sweepstakes begins at 9:00:00 AM Pacific Time (“PT”) on Friday, June 1, 2018 and ends at 8:59:59 PM PT on Sunday, August 26, 2018. PRIZES – Grand Prize: One (1) Grand Prize winner will receive a trip for up to two (2) (i.e., winner and one (1) guest), to Napa Valley, California. Actual value of trip depends on location of winner’s primary residence, destination, fares at time of travel and land accommodations. If actual value of the trip is lower than ARV stated herein, the difference will not be awarded. Round trip coach airfare for winner and one (1) guest to San Francisco, CA from a major airport in 48 contiguous states. ARV of Grand Prize: $3,400.00. WINNER’S LIST – For a written confirmation of the winner (available after 8/28/18), send a stamped, self-addressed envelope (no later than 09/25/18) (postage not required for VT residents), to: Hallmark Movies & Mysteries Summer of Mystery Sweepstakes, Winner Confirmation Request, PO Box 25466, Rochester, NY 14625-0466. 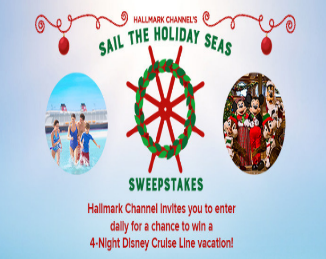 Hallmark Channel® Sail the Holiday Seas Sweepstakes – Win a Disney Cruise for 4! Win a Bahamian Disney Cruise Line trip for four! ENTRY LIMIT – Entrants may enter in this manner once per day throughout the Sweepstakes Entry Period, regardless if the entrant has more than one email address. Upon entry, entrants will have the opportunity to share/or refer the Sweepstakes with others by Tweeting from their own Twitter account. The referrer will receive one (1) bonus entry each time they share the Sweepstakes by following the instructions on the Thank You page (each, a “Bonus Entry”) Limit: one (1) Bonus Entry per Entrant per day. 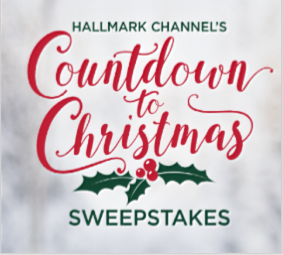 SWEEPSTAKES ENTRY PERIOD – The Hallmark Channel® Sail the Holiday Seas Sweepstakes begins at 9:00:00 AM Pacific Time (“PT”) on Friday, July 6, 2018 and ends at 8:59:59 PM PT on Thursday, July 26, 2018. PRIZES – Grand Prize: One (1) Grand Prize winner will receive a four (4) night Bahamian Disney Cruise Line trip for four (4) (i.e., winner and three (3) guests), to be taken aboard the Disney Dream. Actual value of trip depends on location of winner’s primary residence, destination, fares at time of travel and land accommodations. If actual value of the trip is lower than ARV stated herein, the difference will not be awarded. Travel must be taken between September 1, 2018 and August 31, 2019. Round trip coach airfare for Grand Prize winner and three (3) guests to/from the closest commercial airport nearest to winner’s primary residence to Orlando International Airport in Orlando, FL. All meals onboard the Disney Dream for four (4) (except Remy Fine Dining). Does not include alcoholic beverages. Dinner for up to four (4) adults at Palo; Alcohol not included. Diners must be 18 years of age or older. ARV of Grand Prize: $9,578.72. WINNER’S LIST – For a written confirmation of the winner (available after 07/30/18), send a stamped, self-addressed envelope (no later than 08/27/18) (postage not required for VT residents), to: Hallmark Channel® Sail the Holiday Seas Sweepstakes, Winner Confirmation Request, PO Box 25466, Rochester, NY 14625-0466. 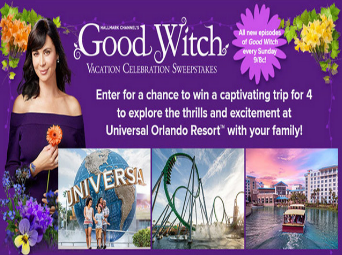 Hallmark Channel Good Witch Vacation Celebration Sweepstakes – Win a trip to Universal Orlando Resort! Win a trip for 4 to Universal Orlando Resort! 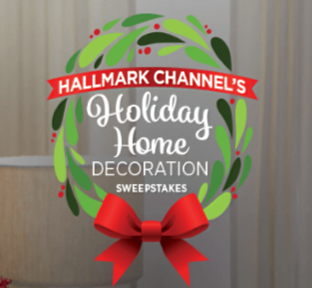 ENTER SWEEPSTAKES HERE – Hallmark Channel Sweepstakes. ENTRY LIMIT – Limit: one (1) entry per person per day and seven (7) Game Entries per person per day, regardless if the entrant has more than one email address. SWEEPSTAKES ENTRY PERIOD – The Hallmark Channel® Good Witch Vacation Celebration Sweepstakes begins at 9:00:00 AM Pacific Time (“PT”) on Monday, April 23, 2018 and ends at 8:59:59 PM PT on Monday, July 2, 2018. PRIZES – Grand Prize: There will be one (1) Grand Prize awarded. The Prize winner will receive a four (4) day, three (3) night trip for Winner and up to three (3) guests to Universal Orlando Resort™ in Orlando, Florida. Trip will include: round trip coach class air transportation for Winner and up to three (3) Guests from a major commercial airport near Winner’s home (as determined by Universal Orlando in their sole discretion) to Orlando, FL; three (3) nights standard hotel accommodation (one room, quadruple occupancy, room and tax only) at Loews Sapphire Falls Resort or at another on-site hotel (as determined by Universal Orlando in their sole discretion); non-exclusive ground transportation to and from airport and hotel in Orlando, FL; 3-Day 3-Park Park-to-Park tickets for admission to Universal Studios Florida and Universal’s Islands of Adventure theme parks and Universal’s Volcano Bay water theme park, for Winner and up to three (3) Guests; and admission to one (1) Blue Man Group Show (exact date and time to be determined by Universal Orlando in their sole discretion) for Winner and up to three (3) Guests. For a Winner who is a Florida resident, air transportation may be substituted with another method of transportation at Universal Orlando’s sole discretion. Hallmark Channel’s When Calls the Heart Wedding Dress Sweepstakes – Win the wedding dress worn by Erin Krakow! 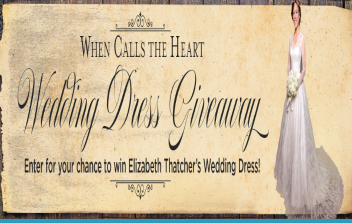 Win the wedding dress that appeared in When Calls the Heart! ENTRY LIMIT – Unlimited entries. ELIGIBILITY – Open to residents of the 50 United States and D.C., 18 years of age or older as of March 5, 2018. SWEEPSTAKES ENTRY PERIOD – Hallmark Channel’s When Calls the Heart Wedding Dress Sweepstakes” begins on March 5, 2018 through April 22, 2018. PRIZES – One (1) winner will be the wedding dress that appeared in When Calls the Heart (ARV of each prize is $2,000).